The Fall 2015 edition of Claytonia, the official newsletter of the Arkansas Native Plant Society, is now available for reading online. Visit our newsletters page and start reading! Paper copies should be mailed to the membership in the next week or two. The first is September 5 to Pedestal Rocks Scenic Area in the Ozark National Forest. More details here. The second is September 25 and 26 at the Tallgrass Prairie Preserve in northeastern Oklahoma – Bison, Birds, Botany & Butterflies. More details here. The Fall 2015 meeting is fast approaching. October 9-11, 2015 in Eureka Springs, Arkansas. More details here. 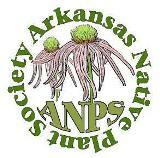 The annual OCANPS Fall Meeting is November 6-8, 2015 at Harmony Mountain. Contact Burnetta Hinterthuer, wbhint@gmail.com, for more details. This entry was posted in Community Event, Field Trips. Bookmark the permalink.